In Japan, we have to recycle air conditioners, televisions, refrigerators, washing machine by the Home Appliance Recycling Law. 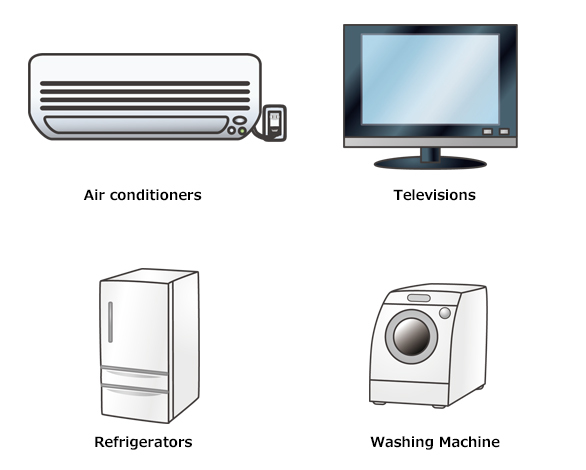 Air Conditioners, TVs, Refrigerators, Freesers, Washing Machines and Drying machine. The Nishida service collects household appliance garbage. Requesting quotation is free. If you'd like to know the detail price, please contact us (0120-953-053 , quotation form). As for Designated Electric Appliances which are Air Conditioners, TVs, Refrigerators, Freesers, Washing Machines and Drying machine, you have to ask the store which you purchased or the store buying a new one. And you have to pay a recycling fee and collection/transportation fee. Do not dispose of Electric Appliances in the collection site designated for regular garbage collection. The Nishida service disposes of your household appliance on behalf of you. (0120-953-053 , quotation form) if you need to know more information. Nishida Service collect and dispose of refuse. Nishida Service can dispose of them instead of you. For more information, please contact us (0120-953-053・quotation form).